I picked up this book on the recommendation of one of my teammates on SparkPeople. I was already familiar with some of Brad Meltzer's comics work, but I hadn't know about his novels. 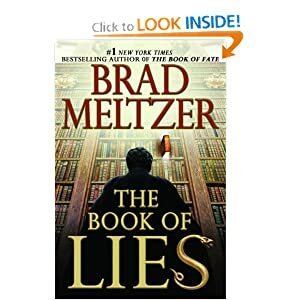 The Book of Lies is a complex but engaging story, part mystery, part history, part family drama, part religion. It weaves together the story of the first murder, the murder of Mitchell Siegel (his son, Jerry Siegel, went on to create Superman), and the search for answers to both. It is written in both first and third person, depending on the view point needed at the time. The first person writer, Cal Harper, is a former ICE (Immigration and Customs Enforcement) agent that is currently working with the homeless. On one of his homeless runs, he comes across a man bleeding from a gunshot wound and stops to help. To his surprise and dismay, it is his father, a man he hasn't seen since his father was taken away during Cal's childhood for the murder of Cal's mother. He takes his father to the hospital and there finds a mysterious shipping label that begins his journey on a search for a prize he has no knowledge of. This search brings him closer to his father, causes him to be on the run from an ICE agent that thinks he killed his father, brings him to the birthplace of Superman and pits him against a secret society that has been searching and killing for years to find the weapon Cain used to slay Abel. It took me a little while to get into it, but once I did, I was hooked. It wasn't so complex that I couldn't follow what was going on, but complex enough to tell a good story. There was enough history in the book to make me want to look more deeply into Jerry Siegel's history, as well as theories about the first murder weapon. The characters weren't quite as deep as I would normal like my characters to be, but the were interesting none the less. All told, I thought it was an interesting story, well told.